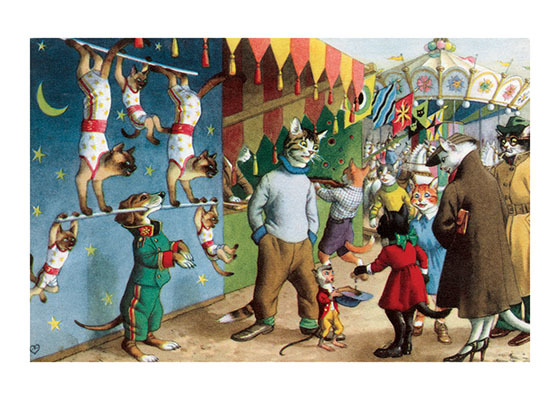 These cats are enjoying the skill of acrobat cats and a skillful Dachshund on the carnival midway. Eugen Hartung (or Hurtong) (1897-1973) was born in Waldi, Switzerland. 'In addition to the Mainzer images he apparently illustrated fairy tale and other children's books, notably the childrens song book Come, Children, Let's Sing (Ch Chinde, mir wand singe) published to promote the Maggi Soup company. He also created several murals in public buildings in Zurich. The Hartung postcards were first published in Switzerland by Max Kunzli of Zurich, printed in continuous tone. From the 1940s through the 1960s, the Alfred Mainzer Company of Long Island City, NY published them in a series of linen and photochrome postcards. They were sometimes referred to as Mainzer Cats. These postcards normally illustrate settings that are filled with action, often with a minor disaster just about to occur. While the dressed cats were by far the most popular and most plentiful cards, Hartung also painted other dressed animals - primarily mice, dogs, and hedgehogs. Typically, the Kunzli cats are featured in European settings and the cards are not as brightly colored as the American editions. Later cards were printed in halftone lithography in a variety of countries, including Belgium, Turkey, Thailand, and Spain. Our greeting cards are custom printed at our location in Seattle, WA. They come bagged with an envelope. We love illustration art from old books for children and early, printed ephemera. These cards reflect this interest in bringing delightful art back to life.